To all of my nice friends who have requested my recipe for this wonderful dish! I am excited to share my Sweet French Onion Soup recipe with you. In the real world, I can only take credit for about three meals worth sharing a recipe with my friends and this is one of the three. However, this recipe has many wonderful memories connected to it which I personally have had an amazing amount of fun by simply sharing this recipe with others! 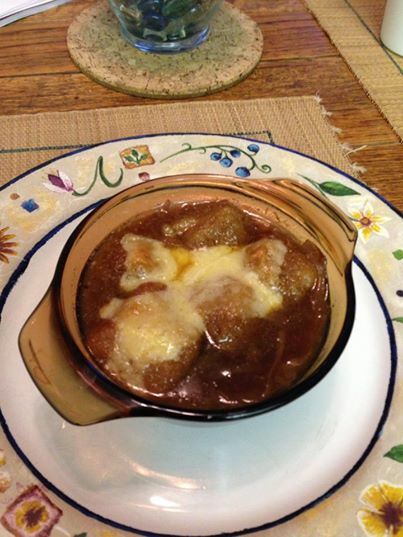 So with that said, I am urging all of you to consider taking time out of your schedule and trying this recipe for yourselves and sharing some “Sweet French Onion Soup” and see if it’s as amazing for you! I am most confident, at the very least, you will make someone else happy! Croutons: Cut French Baguette into 1/2 slices, next butter one side “only” of baguette and then shake Garlic salt onto the buttered side and fry to a medium brown color. This will seal the baguette so it will not sink to the bottom. Crock: Pour soup into crocks, add your homemade croutons, next lace with thick slices of Gruyere cheese over entire top of croutons and crock. Oven: Preheat oven to 350 degrees, place crocks in oven (on large baking pan to make it “SAFER” to remove) and bake for 25 minutes. To brown cheese use a chef’s torch or be “EXTREMELY CAREFUL” and place into broiler to brown cheese. Bon Apetit!